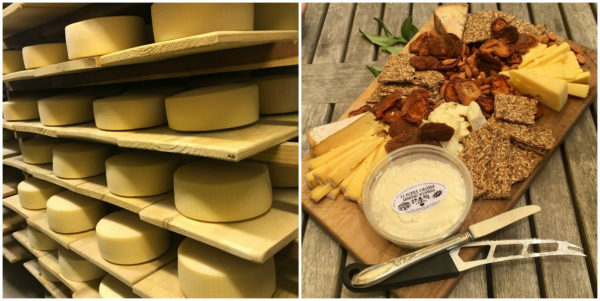 Farmers’ Market vendors Joel and Carleen Weirauch are best known for their small-batch sheep cheese, but their farmstead creamery brings more than cheese to table. With an emphasis on community, humane animal husbandry practices, and sustainable agriculture Weirauch Farm exemplifies the quality and care found only at your local farmers’ markets. Joel studied mycology at the Evergreen State College in Washington which led him to shadow cheesemakers in France. There he saw how cheese was an important part of the local culture and developed an affinity for the unique sheep cheeses that he encountered. He was inspired to bring that passion of cheese-making back to the States. Enter Carleen. She fell in love with Joel and his enthusiasm for sheep cheese. With her knowledge from raising sheep growing up, their fate was sealed. At the time of Weirauch Farm & Creamery’s founding, there were only a handful of other sheep creameries in the state. Inspectors and state workers still weren’t sure how to categorize and regulate non-cow dairy. Carleen and Joel carved out their niche. 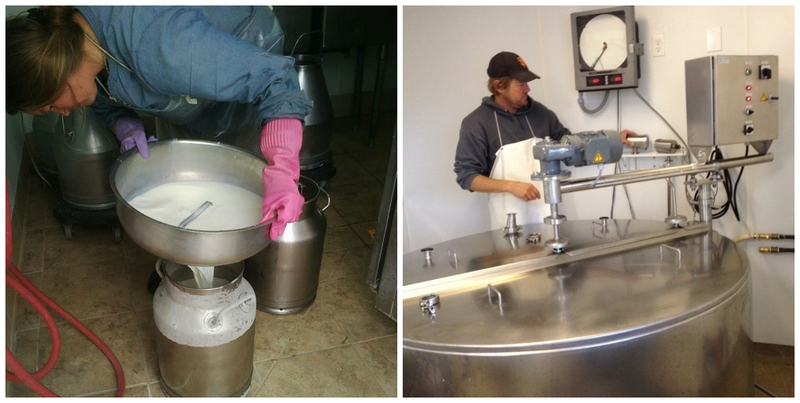 Carleen and Joel moved their farm and creamery to its current location about 2 years ago. The property is owned by a non-profit, Work Horse Organic Agriculture, that provides fresh produce and meat to local food banks. A portion of the meat raised on the farm goes to the non-profit which distributes the ground meat to organizations like Ceres Community Project, Redwood Empire Food Bank, and Worth Our Weight. The property is dappled with oak trees, several small structures (including their adorable tiny home! ), and a large open barn shading the sheep. Their small creamery is a repurposed portable classroom divided in two. The first section is where they make the cheese. There is a 200 gallon vat equipped with fancy probes and machines that monitor temperature and other important important safety factors. The second section is the temperature-controlled aging room. Joel used a lime wash treatment on the walls to mimic the limestone aging caves he saw in France. In addition to the Primo Fresco, St. Rose, and Shepard’s Bell sheep cheese, Joel also purchases cow milk from Spring Hill Farm to create several other cheeses in the off season when their sheep are not producing milk. These include Tomme Fraiche, a fresh cheese aged less than two weeks and Peau de Pêche which is aged for up to 4 months. In April things get busy on the farm, lambs are being born and Joel and Carleen take on the role of sheep midwives, delivering lambs at all hours of the day. After lambing comes the milking season. From around May to October, Carleen stays at the farm where she milks the mama sheep twice a day. Beyond their commitment to crafting delicious artisan cheeses, Carleen and Joel have a larger mission of sustainable and responsible agriculture that includes high animal welfare standards, ecological farming practices, and educating the community on issues related to small scale farming and the local foodshed. They are active members of Fibershed, an organization developing regional fiber systems that contribute to their local economies as well rejuvenate the land they depend on. When you listen to Carleen and Joel talk about their cheese and their sheep you can tell how much they care. But things are not all St. Rose-y. Running a farm with such high standards takes time, money, and sweat, sometimes for little return. There are many challenges that small farmers face and there is not much of a safety net. While they are expanding their network by distributing to small grocers and restaurants and continuing their presence at the Farmers’ Markets, there are still more expenses piling up. Carleen works on the side for her stepfather’s design company, using her art and design skills, to make ends meet. When two of our Ecology Center Farmers’ Market managers, Nina & MC, had the chance recently to visit their farm and walk on the land, they saw firsthand the hard work involved in taking care of sheep and processing cheese with only two people. The tour wrapped up with a delicious cheese spread and discussion about religion, politics, and the recent fires in the area. Carleen shared how they took in displaced sheep during the fire. They recently returned the last one to their owner who sobbed with joy at the occasion. These are folks who put care into their community and their craft. Come build some community with them, by stopping by our Thursday and Saturday Farmers’ Markets, and try their truly delectable cheese. 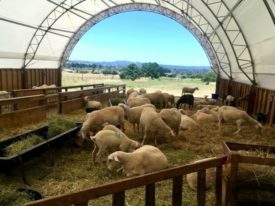 This entry was posted in Blog, Farmers Markets, Featured, Food, Food and Farming News and tagged Berkeley Farmers' Markets, cheese, farm tour, Farmers' Market vendors, food & farming, sheep, small farms, Sonoma fires, Weirauch by Nina Scoville. Bookmark the permalink.